StomaCloak® is an odor reducing pouch and bag cover for ostomy waste bags used in coordination with colostomy, ileostomy and urostomy procedures. The cover is constructed from a proprietary polyester fabric impregnated with activated carbon, zeolite and antimicrobials which adsorb and control odor molecules. Antimicrobials which wicks away moisture and inhibits bacterial growth. The fabric is soft against the skin and is warm in the winter and cool in the summer. Pouch Length when Pouch is Closed Choose an option7" - 8"9" - 10"
Additional fee of $10.00 per StomaCloak. Each custom pouch is designed to fit your bag style. Please mail a bag to our office and production will begin when received. StomaCloak® pouch and bag covers are designed to fit commercially-available ostomy waste bags including Hollister, ConvaTec, Coloplast, and Nu-Hope. StomaCloak® covers are non-disposable, durable and designed to last. Machine wash and dry tested over 30 cycles. The pouch covers reduce noise associated with the plastic collection bag. The pouch covers conceal the appearance of the collection bag. The pouch cover wisks away moisture and inhibits bacterial growth. 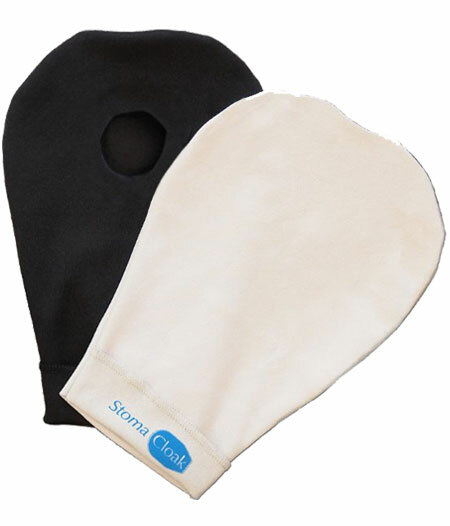 StomaCloak® covers are $24.99 each or $64.98 for three plus shipping & handling. Three StomaCloak® ostomy bag covers normally last for one year. All orders are subject to sales tax. Returns of unused product are accepted within 14 days. Need more ostomy products? Check out Parthenon!